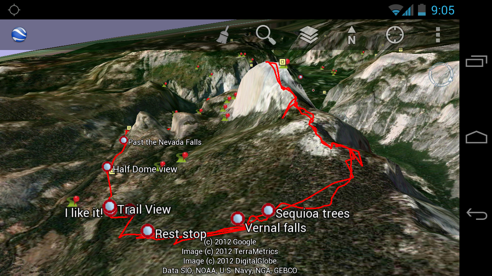 Google has announced that Google Earth Mobile for iOS and Android has received an update. The update brings a much wanted feature to mobile devices in the way of KML file support. What that means is that users who download version 6.2 can now open up KML files to view custom maps while on the go. As well as loading custom KML files, you can also grab other KML files such as the latest earthquake update which are then shown on the globe. If you use GPS to track and log your location you can also represent that information on the map. Overall, its an excellent update well worth looking at. For more details of what else has been included, check out the full announcement over here. To download it, you can use the usual methods such as the iTunes store or from the App Store direct on your iOS device. For Android, you can check for updates on your device or load up the Android market online.